One man climbs 24 flights of stairs several times a day alongside dormant elevators. Street vendors hawk plastic washboards for $20. And families outstretch their hands as crews in helicopters drop supplies in communities that remain isolated. This is life one month after Hurricane Maria slammed into the U.S. territory on Sept. 20 as a Category 4 storm that killed at least 48 people, destroyed tens of thousands of homes and left tens of thousands of people without a job. It was the strongest hurricane to hit Puerto Rico in nearly a century, with winds just shy of Category 5 force. "I've never seen anything like this," retired schoolteacher Santa Rosario said as she scanned empty shelves at a supermarket in the capital of San Juan that had run out of water jugs — again. Maria caused as much as an estimated $85 billion in damage across an island already mired in an 11-year recession. That has complicated and delayed efforts to restructure a portion of a $74 billion public debt load that officials say is unpayable. And it has thrust Puerto Rico's territorial status into the international spotlight, reviving a sharp debate about its political future as the island of 3.4 million people attempts to recover from flooding, landslides and power and water outages. Roughly 80 percent of power customers remain in the dark, and another 30 percent are without water. Schools remain closed. Stoplights are not operating. 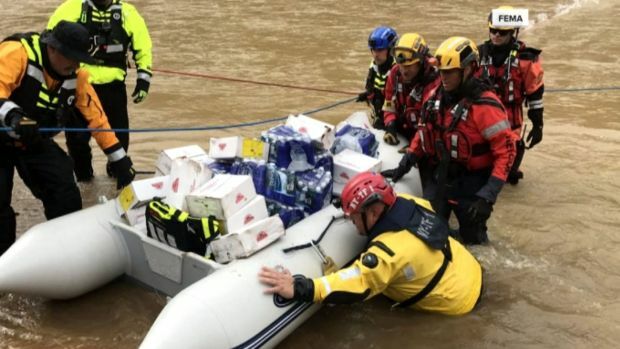 And while nearly 90 percent of supermarkets have reopened, many have bare rows of shelves empty of goods ranging from water to bananas to canned tuna. "We're not eating well," said 28-year-old maintenance worker Pedro Lopez as he took a break from cleaning a damaged apartment complex. "It's a lot of white rice and fried eggs." Near where he stood, massive tree trunks, pieces of zinc roofs and soggy items including mattresses still lined the street — a scene common across the island. Less than half of Puerto Rico's cellphone towers are operating, and only 64 percent of bank branches have reopened, some of them with dead outdoor ATMs whose empty screens prompt a roll of eyes from people seeking to withdraw money. A brown haze has settled over parts of the island as more and more generators are turned on to light hospitals, homes and even the power company itself. In turn, the number of asthma cases and thefts has increased. Newly precious generators have been stolen from places including a nursing home, an airport cargo terminal and a hospital. Nearly 5,000 people remain in shelters, with many using rainwater to shower. "Life has changed dramatically," said Gilberto Del Orbe, 50, who used to install marble and gypsum board. "I've had no work. Everything is paralyzed." Last week, the House of Representatives passed a $36.5 billion disaster aid package for places including Puerto Rico and the U.S. Virgin Islands, and now a group of Democratic lawmakers are pushing for tax relief, saying that people and businesses in both U.S. territories affected by Hurricane Maria receive unequal treatment compared with U.S. states. 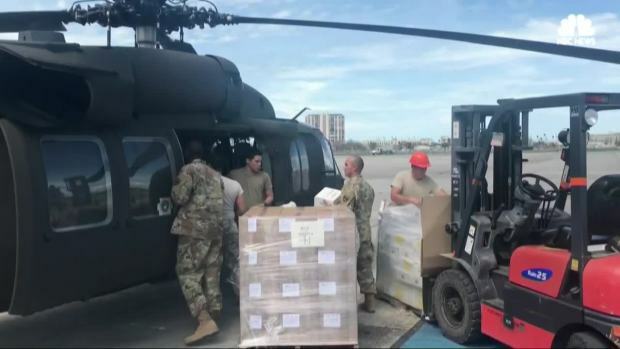 The U.S. Federal Emergency Management Agency also has pledged more than $171 million to help restore power across the island, and it has distributed more than $5 million to municipalities in need, as well as $ 1 million to Puerto Rico's National Guard. Puerto Rico Gov. 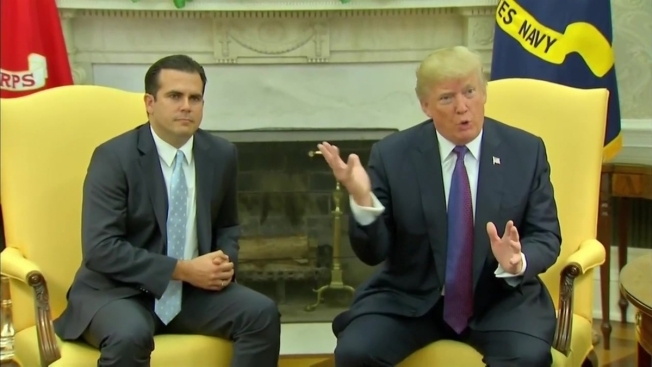 Ricardo Rossello visited President Donald Trump Thursday at the White House. Rossello said Trump "has been clear that no US citizen will be left behind." 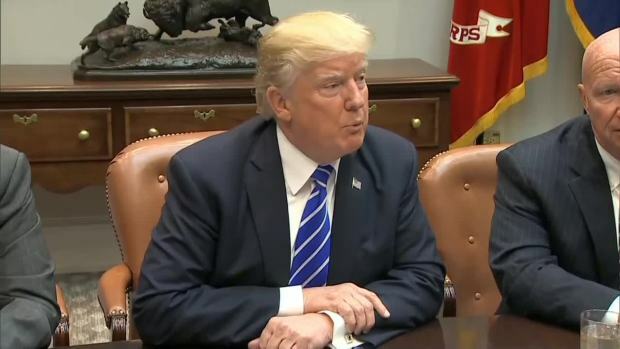 The meeting comes after Trump received some criticism for Rossello's response to Puerto Rico after Hurricanes Irma and Maria. Rossello has been supportive of Trump, while the mayor of San Juan has been outspoken in her criticism. 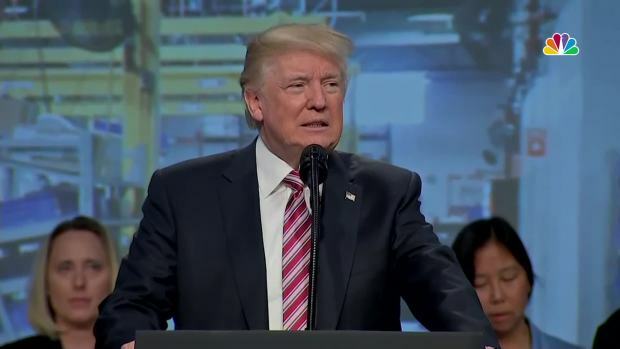 President Donald Trump rebuffed criticism over the time his administration took to respond to Puerto Rico's pleas for aid following Hurricane Maria. He cited the geography of Puerto Rico, the scale of the damage done to the island, as well as a shortage of help from local authorities who had to see to their own families in wake of the disaster as a defense. Resident Commissioner Jenniffer Gonzalez said the storm set Puerto Rico back 20 to 30 years, and while generators, food, water and other types of aid are still being flown and shipped to the island, people say it's not enough. "We lost our home and we lost our car," said Lisandro Santiago, a 42-year-old carpenter who started work just a week ago and was overseeing a crew repairing an apartment complex. He and his wife, their three children and his mother-in-law are staying in a 13-by-9 foot (4-by-2.7 meter) room that remained unscathed as the hurricane ripped the rest of their home apart in the north coastal town of Dorado. "I'm leaving Friday for Massachusetts. I can't stay here." He is among tens of thousands of Puerto Ricans trying to restart life in the U.S. mainland after losing homes or jobs or both after the storm. Those who remain behind say the post-hurricane conditions are draining them. The complaints posted on social media or shared over beers or candlelight dinners are multiplying: Weight loss. Roaring generators. Sporadic sleep in oppressive heat. Swarms of mosquitoes. Worsening traffic jams. Breakouts of pinkeye. Hands rendered raw by daily clothes washing. Celebrations of power coming back on in certain neighborhoods are often brief: A litany of happy exclamation points following messages of elation posted on social media are usually replaced a day later by angry emojis. Many use social media to post endless questions on post-hurricane help: where to find fans with batteries (nowhere so far); where to find affordable baby sitters as some parents return to work while schools remain closed (Many suggested finding unemployed friends); what's the best way to wash clothes by hand (A majority of votes went to someone who suggested placing them in a big garbage bag with water and soap and shaking it vigorously). "If it continues like this, a lot of people are going to leave," said Rosario, the retired schoolteacher. "But not me. I will stay here." She paused and then continued to push her cart slowly through the aisles, searching for new food options after having eaten sandwiches of canned chicken and asparagus for breakfast, lunch and dinner.